In 1871, the last Hewitt child was born. Erskine Hewitt was named after the Revolutionary War General, Robert Erskine. He attended school in New York City. During his youth, he accompanied a party from the US Geological Survey going to Yellowstone and spent the summer with the group under direction of Arnold Hague. Abram Hewitt at the time described his son as "a quiet, unpretentious boy of considerable ability and irreproachable habits. He does not lose his temper, in which respect he is in marked contrast to his father." Erskine continued his education at Princeton University, where he received his Bachelor's and Master's degrees. He later attended law school at New York University. He spent a short amount of time working for the law firm of Parsons, Shepard, Ogden & Closson, but left to pursue other interests. After the war was over, Erskine joined the Cooper & Hewitt Company of his father. After the company was merged into the United States Steel Corporation, he became interested in various business and real estate pursuits. For several years he was a member of the finance and executive committees of the International Business Machines Corporation (IBM). He was vice president and director of the Union Sulfur Company, the Electric Ferries, Inc., and the American Silicone Company, and President of the Gauley Mountain Coal Company. Erskine was later president of various real estate enterprises, including the Ringwood Company, Hewitt Realty Company, and Westboro Realty Company. The Ringwood Company, under Erskine's direction, helped to develop several communities located within the current towns of Ringwood and West Milford. Upper and Lower Erskine Lakes, Cupsaw Lake, and the community of Awosting on Greenwood Lake all had small log cabins and cottages built around them as summer residences. Erskine himself owned and lived at a home on Cupsaw Lake that was nicknamed "Erksden." During Erskine's lifetime, he became deeply interested in American history and amassed a huge collection of early Americana, Revolutionary War relics, miniature portraits, and political and presidential items. He also took a keen interest in the history of Ringwood Manor and the Ringwood mines. Much of his historical collection was displayed at the Manor with a focus on the Revolutionary War history of the property. Erskine even penned a small booklet called The Forges and Manor of Ringwood that described the various historical objects of interest around the property along with the history of the site and structures. As a philanthropist, Erskine supplied property for a large school for the town of Ringwood. His only requirement was that they name the school after his sister, Eleanor G. Hewitt. The school is still utilized by the town today. After his sisters' deaths, he donated hundreds of decorative arts pieces to the Museum at Cooper Union. He continued his family's tradition of financially supporting Cooper Union by willing a large sum of money to the educational institution. This support was supplemented by a large auction of his estate in New York City during which many historical and art items were sold for the benefit of the Cooper Union fund. 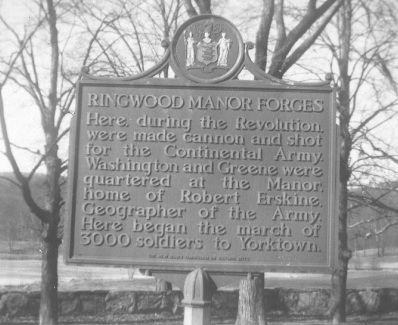 Erskine recognized the historical importance and natural beauty of Ringwood Manor and began to look for a way to preserve it for public use. Shortly before his death in 1938, Erskine Hewitt presented Ringwood Manor to the State of New Jersey in order that it be opened as a museum and state park. His nephew and heir, Norvin Green, continued Erskine's legacy by presenting additional acreage and the interior contents of the Manor. Today, the Ringwood Manor museum and park are visited and enjoyed by thousands of people all year round.